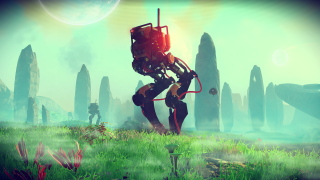 The massive, procedurally-generated, and undeniably lovely space exploration game No Man's Sky is scheduled to come out in June 2016. The launch window (because it's not really a launch date) was revealed at the end of a new gameplay trailer that debuted during Sony's PlayStation media event at Paris Games Week. The video is gorgeous, and sets the already-high bar for No Man's Sky even higher. If it lives up to its promise, it will be nothing short of amazing. We spoke about the game at length with Sean Murray, co-founder of No Man's Sky studio Hello Games, at E3 earlier this year. Catch our conversation here.